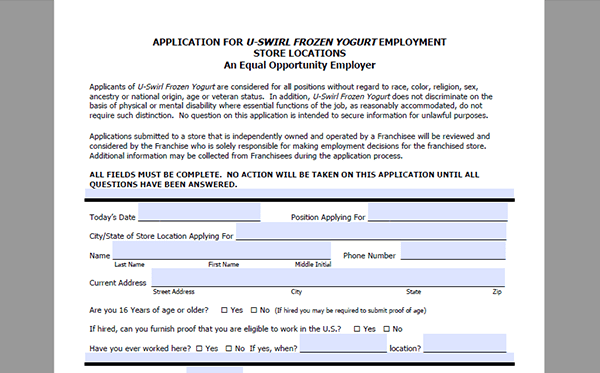 Download the official U-Swirl job application via the link provided on this page. Read the instructions/how-to guide posted in the below section to learn how to properly fill out the form. The downloadable application form must be submitted in person at a location in your area. It’s recommended to contact the specific location that you want to apply to and talk to the manager regarding current opportunities (before submitting an application). About the Company: U-Swirl is an American chain of frozen yogurt shops based out of Henderson, Nevada. The company was founded in 2008 and operates/franchises numerous stores throughout the country. Step 1 – Download the official application form by pressing the link/button at the very top of this page. Step 2 – The form can be opened/edited in any .PDF editing program. Note: You can also print the form out and fill it in with a pen. If hired, can you furnish proof of your legal right to work in the United States? Have you ever worked here? If yes when? Location? Are you seeking full or part-time hours? Are you currently employed? If yes can we contact your employer?